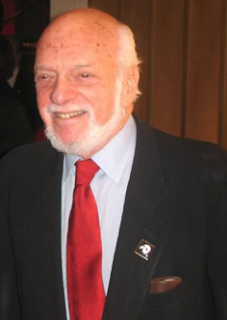 We were just going to hop over this week, but then I had my interview this morning with legendary Broadway producer-director Hal Prince of Phantom, Evita, Fiddler, Sweeney Todd, Damn Yankees, Cabaret and Pajama Game fame. It turned out to be a fascinating hour as well as a newsmaking one, so now it's up for all to hear. Right-click here to download it to your computer or click here to get it to play for you. * Predicts the Vegas version of "Phantom" will run "indefinitely"
* Offers up a split-decision on Patti LuPone's on-stage outbursts. * Tries to explain why getting free pajamas and sewing machines for "The Pajama Game" in exchange for free promotions for the manufacturers wasn't an early version of product placement. Prince's last remark said it all: "You're a good interviewer, but you're dangerous." Prince is the keynoter for the first Phantom Fan Week in Las Vegas, which runs from Sept. 16-20 at -- where else? -- the Venetian. You can subscribe to the podcast via iTunes or Zune to get the shows automatically when they're out. If you’ve ever before heard of the man I’m writing about this week, I already know what you know. Every article and interview available online refers to Ted V. Mikels as a savant of sorts, an indefatigable and perversely genius filmmaker with a cult following of folks who adore his no-budget flicks and revere him as a surviving visionary of the Ed Wood School of Campy and Bizarre Cinema. No, this isn’t going to be that kind of column. Although I had never heard of the guy prior to lunch last week with a journalist friend from Germany—Mikels is evidently big in Deutschland—I have been assured by my own Weekly editors that the longtime Las Vegan who created such Oscar bait as Demonheart and Corpse Grinders II has, in fact, enjoyed his local media close-ups several times. So, okay. This isn’t going to be a piece about how terrific Ted V. Mikels is—and for good reason. I have a different story to tell. Ted V. Mikels is 80 years old and broke. He vacated his 2,500-square-foot studio near the Mandalay Bay a couple of months ago. Most of his old 35mm filmmaking equipment is in the Apex landfill, as he was unable to sell it off. His credit cards are maxed out, the equity in his modest east side townhouse has been spent and he has absolutely no idea how he’ll make his mortgage payments. So I'm working on this little story about all the weird stuff going on around Vegas for 9/9/09 and I start going through all the promotional emails I had received pertaining to said numerology. Most was junk. When I came to this one, though, I was a bit in disbelief. Still am, actually. We'd already featured Restaurant.Com as a Top Secret Tourist Tip of the Week earlier this year. 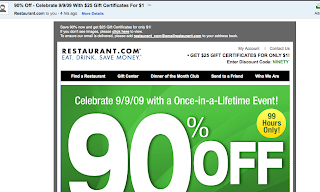 It's a great site that sells restaurant gift certificates at discounts. That is, typically a $25 gift certificate costs $10. Already, that's a bargain. But for a 99-hour span this week -- starting today, natch, and going through Sunday, Sept. 13 -- they're giving 90 percent off the price using the discount code NINETY. That is, a $50 gift certificate for AGO at the Hard Rock, normally costing $20, is now $2. Really. 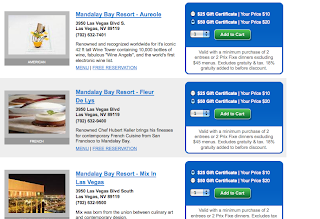 The restaurants at Mandalay Bay are especially well-represented, including Aureole, Fleur de Lys, RM Seafood and Mix. But there are also some interesting off-Strip places locals love, like Rosemary's, Yolie's and Chicago Joe's. This is kind of an amazing opportunity to enjoy serious discounts or buy some early Xmas gifts. There are some restrictions -- some restaurants require a certain dollar amount to be ordered -- but I just spent $9.80 on $240 worth of dining certificates. I picked up a few for some restaurants I go to occasionally -- Strings, Cafe Heidelburg, Tillerman and Hash House A Go Go -- and a couple I'd never tried but sounded interesting, like Streets of New York. Welcome to the new VegasHappensHere.Com! A word about the thought process behind the way VegasHappensHere.Com is now branded. My inspiration over the past several years has been Nikki Finke, the L.A. Weekly columnist who has turned herself into probably the most important journalist in the Hollywood business thanks to her blog, Nikki Finke's Deadline Hollywood Daily. In fact, when I decided to change the name from The Strip Podcast Blog to Vegas Happens Here, I did so after considering renaming it Deadline Vegas as an homage to Finke before realizing just how derivative that would seem. So the content of this site remains exactly the same. You'll find breaking news and incisive commentaries about the Vegas entertainment and business scene as well as photo journeys into places that others don't get access to. This site remains a portal for "The Strip" podcast and "The Strip Sense" columns in the Las Vegas Weekly and a space for musings about my personal and family endeavors, too. Oh, and here's a tease: You're about to see a bit more of me on TV. When it comes to pass, you'll understand why this site needed an overhaul. Stay tuned! I managed to keep the show going through the summer, but this week I'm just too slammed trying to get my real work back up and running. We'll resume next Tuesday! Sorry! * NFL fans ought to bookmark this Review-Journal link so they know which bars to go to to watch their games with like-minded fans. I've used this in the past on the podcast as a Top Secret Tourist Tip of the Week, a very useful guide that more tourists ought to use. Cool interface, too. When I say bookmark it, though, I mean it, because you'll never find it again on that ridiculous website if you don't. * If you want to hear something truly, positively weird, listen to the first five minutes or so of KNPR host Dave Berns' "State of Nevada" interview on Wednesday morning with comic Bill Cosby. Honest to God, I have no idea what Cosby is saying and Berns' valiant efforts to make sense of it was fruitless, too. But since it's Cosby, there's something fascinating about it anyway. I'm not all the way through this interview yet, but already I know it's going to be a thrilling mess. 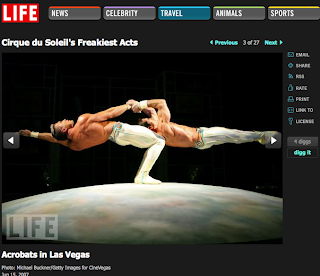 * I just noticed that Life Magazine's website now offers a pretty photo album of 26 Cirque du Soleil photos. They call it "Cirque du Soleil's Freakiest Acts" and, really, it's not, but the photography is terrific, colorful and fun. Downside: Only three Vegas images -- I think just one of an actual moment in one of their six-going-on-seven shows -- and none of its best, most eye-popping and "freakiest" show, Ka. * Two Las Vegas Weekly pieces (other than my own column, natch) are of great tourist interest this week. First, Dr. Dave Schwartz of UNLV and DieisCast.Com stands up for you (and us) against the presumption that people who love Vegas and gambling are stupid. Then Richard Abowitz writes glowingly about RateVegas.Com's Hunter Hillegas' groundbreaking Vegas Mate iPhone app. Buy it at the iTunes store or win a subscription by being right and being picked in my show's biweekly trivia questions, by the way. And unlike that Monte Carlo-Hotel 32 thing we debunked recently, this is a real app.